Phinizy Swamp Nature Park for the Southeastern Natural Sciences Academy.- Master Plan for development of the Phinizy Swamp Nature Park in Richmond County, Georgia as an educational/recreational facility related to environmental issues. The Nature Park encompasses over 5,000 acres of bottom swampland adjacent to the Augusta wastewater treatment plant’s tertiary Constructed Wetland project (also designed by ZEL Engineers). 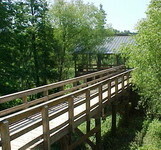 The Park includes City of Augusta Property, Georgia DOT property and private property. 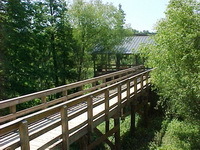 Construction included boardwalks, wooden bridges, restrooms, kiosks, paths and trails and two buildings for interpretive stations.